Hosting a group of Purple Martins will certainly help keep down the flying insects in your neighborhood, as they eat insects while in flight. Since it also gets its water in the same manner, by skimming over the surface of a body of water, you don't need to put up a bird bath for this species. When you've built your Purple Martin housing complex, you'll need to mount it a good 15- to 20-feet above ground. Make sure you secure it well and mount it in the shade to help keep the indoor temperature down during hot weather. Nearly everyone knows swallows of one variety or another. The most beautiful of the family are the martins. This bird is of great service against the inroads of wasps, bugs and beetles. It prefers to live in colonies even though the males fight bitterly at times. Martin houses should have at least several rooms, each separate from all the others. Houses have been built to accommodate fifty and more families. 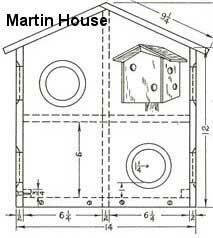 The most difficult houses to build are those for martins. 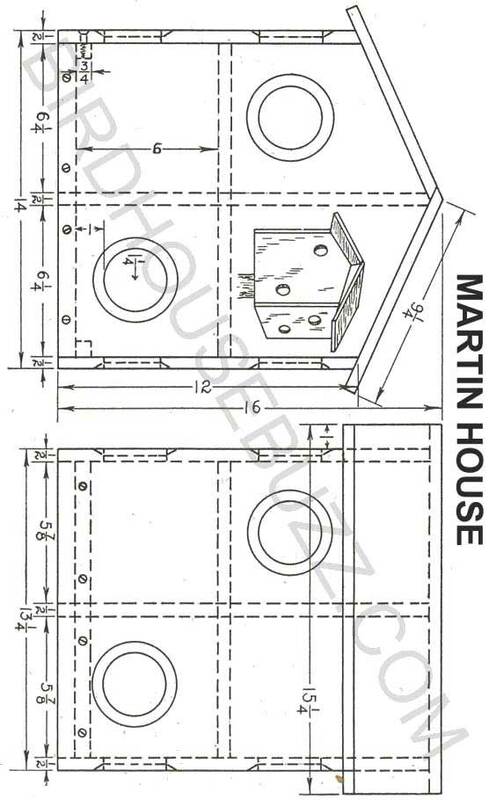 This free martin house plan is for a small home arranged to care for eight families. The doors or openings are 2-1/2" in diameter and can be made with an expansion bit or a key-hole saw. All of these houses are to be made so they may be cleaned. The houses should be so located that cats and other bird enemies do not have easy access to them. The openings should be turned away from the directions the storms and winds come most often; and the house should hang or tilt so rain doesn't run in at the entrance.